Last week, Switzerland’s federal council, or cabinet, said it was against the vote to ban burkas nationwide. Instead it prefers a targeted approach. Last year enough signatures were collected to launch a federal vote on whether to introduce a ban across all of Switzerland. The federal council thinks the decision should remain largely in the hands of cantons. The Italian-speaking canton of Ticino introduced a ban on face covering in 2013, while voters in the cantons of Solothurn and Zurich rejected similar ban proposals. No other cantons have voted on the issue. While the federal council recognizes that face covering can sometimes pose a problem, it proposes a more targeted approach in its counter proposal. For example face covering would not be allowed when dealing with certain authorities. The law already requires faces to be uncovered for identification purposes. The counter proposal would clarify this further, for example requirements on passenger transport. And, anyone forcing a woman to cover her face would face up to three years in prison. In addition, the federal council believes cantons should have wide scope to decide on the matter, in particular, how to treat tourists from Arab countries. 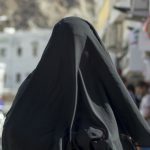 The initiative, which seeks to outlaw full face veils nationwide, would also apply to protesters covering their faces. A poll in January 2018 suggested that 76% of the population was in favour of it.